Four more amazing stadiums from the USA have joined our database over the past hours. Old Gray Lady, Between the Hedges – what do those nicknames stand for? As in many cases, the catalyst for building a new stadium was local rivalry. University of Georgia had a stadium too poor to hold home games against Georgia Tech and had to play at the rivals’ home ground. When they lost 12:0 in 1927 despite being unbeaten in all games against other teams prior to their defeat, Dr. S. V. Sanford decided it’s high time to build a stadium. Not just any stadium, but one that would be “bigger than Georgia Tech’s”. The preferred location was a local valley on campus, where sloped land gave natural support for terracing. At the same time however, the site forced the field to be located along the east-west axis rather than the traditional north-south one. To finance the project Sanford asked alumni, students and residents to become guarantors of the university’s loan. Within months $150,000 were secured, representing over 40% of the total budget. Its initial configuration was similar to many other venues with stands on both sides of the field. Capacity stood at around 30,000. Ever since opening against Yale in 1929, the field was surrounded by hedges, earning the stadium its nickname of “Between the Hedges”. The vegetation changed over the years, but remains to this day. Hedges are also considered to be an efficient barrier preventing pitch invasions. First expansion took place in 1949, already after Sanford’s death. The main grandstand in the south saw 6,000 seats added. In 1967 a much greater expansion took place, adding upper decks on both sides. At that time temporary seating existed behind goals. Finally in 1981 the east stand was added, creating a horseshoe shape. It also blocked the view from nearby hill, from where many people used to watch games for free. West end wasn’t possible to match the tall other stands, because of a bridge running along it. A lower tier was built in 1991. By the end of the century also first skyboxes were added in the south, 50 altogether. In 2003 a third tier was added in the north, later expanded with skyboxes. This way the university nearly reached 93,000, but expansion plans are already in place. Local team Bulldogs have been playing here since the opening, gathering some of the country’s largest crowds. However the stadium also played host to major soccer games, like during the 1996 Olympics. If it seems visually familiar, that’s for a very good reason. The Notre Dame University stadium was highly influenced by Michigan Stadium design, of course in smaller scale. Single-tiered stands created a continuous bowl around the field, raising 14 meters above ground level. Initial capacity stood at roughly 54,000, but after readjustment of the bleachers over 59,000 people could be squeezed in. Construction of the steel grandstands was quite short. While officially it took nearly a year, works were very limited for the first few months due to harsh weather. The uniform bowl with 55 rows was enough to cope with demand for some three decades, but since 1960s almost every game of the Notre Dame Fighting Irish has been sold out. That’s why in 1997 the building saw its first expansion. 23 rows were added throughout the stadium, exceeding 80,000 total capacity. Slight corrections in the seating (adding a couple front rows among other) led to the final number being 80,795. This capacity stayed unchallenged until in 2014 the university announced further expansion plans. Large commercial additions in separate buildings will raise capacity to roughly 85,000 by 2017. 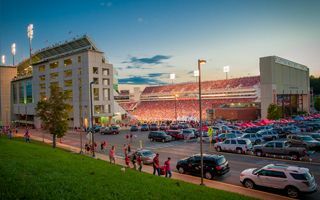 Since 1901 the University of Arkansas only had a modest football field located on “The Hill” (some 200 meters east of current stadium) with roughly 300 capacity. Only in 1938 construction began on the new ground, which was able to hold 13,500 people at the time of opening. Compared to the former ground it was a giant leap, but nowadays that size seems very humble. After a long series of expansions by early 1980s the ground already had 50,000 capacity. All that with just two permanent grandstands on each side of the field. Both ends were left empty or nearly empty. A pavilion with sports facilities was built in the north and temporary stands set up in the south. Things changed massively around the end of the millennium, when construction of the new south stand began. While part of the funding went towards upgrades of existing structures, the new south end consumed over 200 times the amount it took to deliver the stadium back in 1938. The expansion’s outcome is interesting for one particular reason. Two tiers of seating are topped by skyboxes which in turn are topped with a very modest seating balcony. That modest seating balcony may be temporarily expanded by as many as 8,000 additional seats if demand is sufficient. Thanks to these temporary seats, attendance record of nearly 80,000 was set up by 2010. The stadium was designed in 1926 by locally famous architect David O. Whildin, planned to resemble the monumental amphitheaters of Europe. A horseshoe shape with open north end and arcades decorating its exterior never came into full existence, though. In 1926-1927 only western and eastern sections were built, the latter ones only to half the planned height. This resulted in roughly 20,000 capacity, which was increased largely quite soon. In 1934 lower part of the curved south end was built (25,000) and in 1948 the east side was expanded to match the west one (45,000). A peculiar expansion came in 1961-1962, when an upper deck was created literally on top of the east stand, increasing capacity by 9,000. The upper deck caused controversy for safety reason and was eventually dismantled altogether (but that came only in 2004). In 1965 the north end was built, disabling the horseshoe scheme for good. Moreover, it was straight rather than curved. Later the south curve was also demolished, running track removed and the stadium became a fully “rectangular” one. At peak, with the upper deck, it reached over 83,000 capacity, helping it earn the nickname of The Football Capital of the South. It’s also more genially referred to as the Old Gray Lady. The stadium’s unified shape is broken by expansion of the western press box. The box itself dates back to 1965, but was later expanded to accommodate two small balconies of covered seats. These two modest balconies are provided with access by large spiral ramps in south- and north-western corners. Almost from the start the building was used for university football, being the home of several teams. Alabama Crimson Tide began their history here in 1927 only to leave in 2003. Auburn Tigers left earlier, in 1991, while the latest long-term tenant is the UAB Blazers, team that will return to the stadium in 2017 after league system changes. Birmingham, Alabama is hardly as associated with “soccer” as the English one, but among American cities there’s quite a story here. In 1996 the Olympics had part of the soccer/football tournament played here and later both male and female national teams played their home games here, both friendly and competitive.